“It’s supposed to hurt,” a teary-eyed coach Rex Ryan said after his New York Jets lost to the Pittsburgh Steelers and failed to get to the Super Bowl. Rex, who was born in Ardmore, Oklahoma, is the son of Buddy Ryan, the former Philadelphia Eagles and Arizona Cardinals head coach, and is the twin brother of Rob Ryan, defensive coordinator for the Dallas Cowboys. 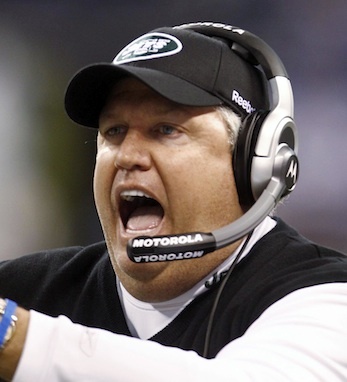 The Jets may have lost out on the Super Bowl but no one is blaming the coach. Ryan, in his second year as coach, turned his team (from what some pundits called a “laughingstock”) into contenders and won the respect and love of his players along the way. Before coaching, Ryan played defensive end at Southwestern Oklahoma State University. He went from being a college player to an assistant college coach of Eastern Kentucky, New Mexico Highlands and Morehead State. He started coaching NFL teams in 1994, starting as the defensive line coach of the Arizona Cardinals, alongside his father, Buddy. In 1999, he became the defensive line coach of the Ravens and earned a Super Bowl XXXV ring with the 2000 team. He was soon promoted to defensive coordinator of the team and was named Assistant Coach of the Year by Pro Football Weekly and the Pro Football Writers Association in 2006. He then earned a spot as the assistant head coach for the team. In 2009, Rex Ryan was named the head coach of the New York Jets with a four-year contract at $11.5 million. The defeat by the Steelers in the AFC Championship knocked the Jets out of the running to go to the Super Bowl, but Rex Ryan has no plans to give up in upcoming years. His contract has been extended to 2014.